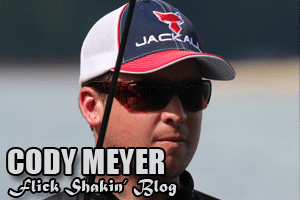 I’ve been looking forward to the Cup all year, especially since it’s taking place at Lake Lanier. 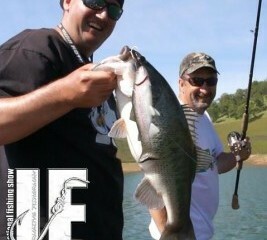 I love fishing spotted bass, and that’s what I plan to target. It’s always exciting fishing for something you feel comfortable doing. Lake Lanier hasn’t changed much in the two years since I last fished it. I’m feeling good about the tournament, but it will definitely be tough. The bite is similar to the last time I was here. My strategy is going to be to run and try to fish as many spots as possible so I have a chance at getting a good limit. 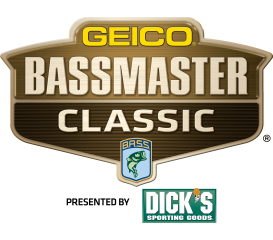 I think it’s going to be one of those tournaments where it’s not going to be hard to get a bite, but catching the bigger fish is going to be more difficult. Right now, I’m not sure how to do it for 4 days in a row. I’ve got nothing to lose so I’ll just go for broke. I don’t have to worry about catching a smaller limit of fish like I would in a regular tour event just to get points. So I’ll just fish to win all day because I’m getting a check either way – a good check too. This lake is notorious for having heavy boat traffic, and I think the boat traffic helps the bite. The wake from the boats is almost like a natural current. When it was dead flat calm out there, they really didn’t bite and they were more suspended. Then when people were starting to run around in their boats and stir up the lake, the fish bit a lot better. The fish are so used to the boats being out there all the time that it doesn’t bother them. This seems like the worst time to be fishing this lake as far as how fish are going to react, since they’re going to be suspending. That said, a tough bite and clear body of water works well with my strengths. My prior experience is definitely going to help me out. Two years ago, the lake was about 6 feet higher than it is now. The main two brush piles are to high up in the water column now. It seems the local guys don’t plant brush piles when the water is down, so there will be less brush to fish this year. That will make the competition a little tougher. The only real advantage of fishing Lanier two years ago is that I remember some of the areas the fish here live in, but I’m hoping to find some new areas this year. Another advantage I have is my Typhoon sunglasses. They cut down on glare and allow me to see fish roaming the shallows on occasion. I can also see bait fish on the surface since the water is so clear, so this will be a very visual tournament. For the fish I can’t see with my eyes, I’ll be able to use my Lowrance graph to see the deeper fish on the graph. It seems like people will be fishing different areas this year; two years ago, they dominated going deep, but there looks to be a good shallow bite this year. The largemouth population appears to be back and strong. 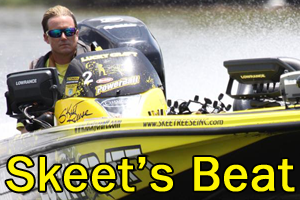 Looking at recent tournament results, there have been a lot of five bass limits with all largemouths. Even when I was practicing, a lot of guys were getting 18 pounds of largemouth. I know there are some big fish to be caught. Catching them is the puzzle we will all be looking to solve in a few weeks. My goal this time is definitely to win, but if I can’t do that I’m at least looking for a strong finish. It’s the last tournament of the year and there’s nothing to lose, so I’ll shoot for the win, but I’d be happy placing in the top 10 or so. In a tournament of this caliber, a win would be amazing. 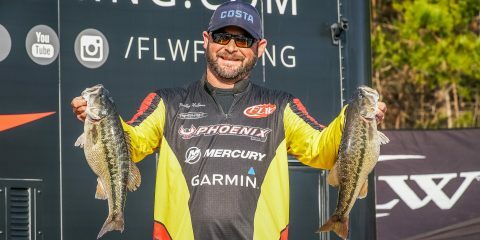 When you put 50 of the best anglers in the world on a body of water loaded with bass, like Lanier is, just about every guy has a shot at winning. It should be fun and I’ll try to report back right before the event and as much as I can during the event.